In this picture, Ashley and I are at the Rutgers football game! Football is such a fun time with my friends. I have not missed one game this year! Watching Ohio State play and defeat most teams is such a great feeling. It’s an even better knowing that every single person in the shoe, well almost everyone, is rooting for our team and wanting us to succeed. 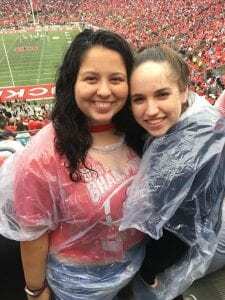 Football games are important to me because they give me a way to connect with everyone at Ohio State, even those not interested in football, like me, can still enjoy the games because everyone in the stands is so energetic all the time. When we score, everyone freaks out and it is such a great feeling. Beating Rutgers is so easy too that it makes it so much more fun because you know you’re going to win! I love going to the games because they are a fun time with my friends and it’s a great way to remember how much I love my school.